Engineering companies now prefer to talk about “additive manufacturing” rather than “3D printing,” writes The Economist (May 3, 2014). One reason is that printing is not quite the right word for some of the technologies given this label. Whereas hobbyist-scale 3D printers typically build a product by squirting out drops of plastic, a newer manufacturing technique called selective laser melting zaps successive layers of powder with a laser or ion beam, hardening only certain bits. Larger firms want to stress the “manufacturing” aspect: that technology has moved beyond the development labs and is now being used on the factory floor to make complex metal parts. 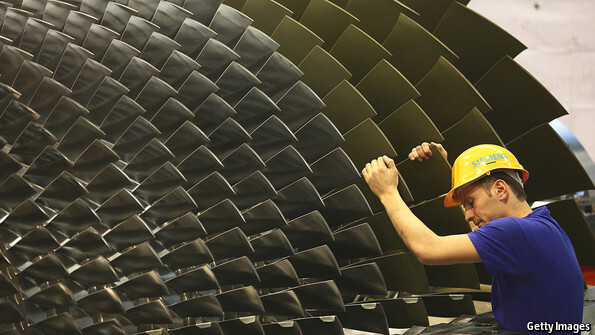 In Siemen’s gas turbines, for example, elaborately shaped blade components are hard to design and costly to make. But Siemens is using additive manufacturing machines to cut the cost and the time needed to replace the blades on customers’ turbines when they break– eventually from 44 weeks down to 4. For simpler mechanical parts, the approach allows designers to imagine shapes that would be impossible to create through older techniques, besides greatly speeding up prototyping—for turbine blades and similar parts, from 16-20 weeks to just 48 hours, Siemens says. Additive manufacturing cuts the cost of tooling and materials: a piece can have all of its holes incorporated into it, with great precision, as it is built up from powder, instead of needing to have them expensively drilled afterwards. Siemens hopes to cut the cost of some parts by perhaps 30%. As it gets easier to make low-volume, specialized parts in-house, Siemens gains bargaining-power when it comes to outsourcing such parts to other firms. Aircraft engines, subject to even higher standards of reliability than turbines, are another area in which the engineering giants have implemented additive manufacturing. GE is using it to make fuel nozzles for its next-generation Leap engines. GE says the nozzles will be 25% lighter and five times more durable than their predecessors—and since there are 20 or so in each engine, the weight savings are significant.